Hereford: Otter-Barry Books, pb. 978 1 9109 5989 3, 2018, £6.99, 96pp. 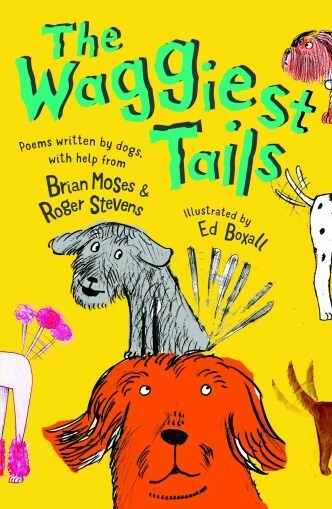 In this book in Otter-Barry Book’s poetry series to encourage children to read and enjoy poetry, we have two very well-known poets, Brian Moses and Roger Stevens. Brian Moses has a red-fox Labrador, Honey, and when asked to compose a poem for the Queen’s 80th birthday he wrote one about her corgis. Roger Stevens has as very-shy dog, Jasper. Both have very distinctive styles that are very dissimilar, but both obviously love their dogs. There are 53 poems with varied illustrations to match the character of the dog described in the text. The author’s mainly alternate in composing each poem. but instead a book of smells. In ‘Walk Time?’ [BM] the dog is preevish in his/her wish to go for a walk, whereas in ‘Bruno, the Smallest Dog’ [BM], the smallest dog complains about larger dogs but finds that there are compensations. It ends rather sentimentally when the dog grins after being is picked up and rubbed because of being the smallest. In ‘Is it Worth a Widdle?’ [BM], this dog doesn’t consider his/her impact! How do the trees feel about being weed on and I am sure the car owner objects to the wee on this car wheel. As for the passengers at the bus stop …! The missing person in ‘Missing’ [RS] is the master: ‘I wonder where my human is/ I wonder where he’s gone.’ The dog imagines all the worst things that could of happened to his master, including being hit by a bus on his way home. The illustrations in this book exactly match the tone of each poem and will often make you smile. ‘My Dancing Friend’ [RS] is illustrated with the dancers in various poses and the dances include the cha cha cha, the foxtrot and the polka. One dog favours breakdances and hip hop. Composed entirely from the dog’s point of view this book seems particularly for dog lovers. There is an absence of any negative content regarding potential aggressive or dangerous behaviour of some dogs, or of their potential to soil in public spaces. Nor is the question of a dog owner’s responsibility for their pets behaviour towards other people, or their litter habits raised. These omissions seem to me to be a missed opportunity as children need some guidance about approaching a dog that they are not familiar with. I would only recommend this book if you are a dog owner and lover of dogs.